The Geeky Chef Strikes Back Cookbook | Nerd Much? Milk of the Poppy will definitely help if you've got a cold that needs curing. 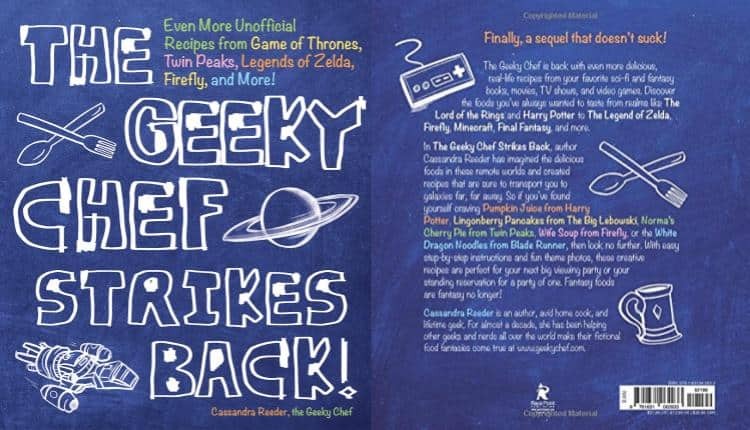 If you have a geeky cook in the house, The Geeky Chef Strikes Back Cookbook by Cassandra Reeder is sure to make a great Christmas gift. This book has it all, from the pumpkin juice of Harry Potter to Mabel’s pasties from American Gods. There is quite the range inside this book, each section has a few recipes, each reflecting foodstuffs from a variety of TV shows, games, movies, and books. From the non-alcoholic drink section, there is Milk of the Poppy from Game of Thrones, which is quite the drought. It is not exactly a soothing drink when both ginger and turmeric are included, but it still definitely help if you’ve got a cold that needs curing. Under main courses, there are 9 recipes, each quite heavy on the meat. This is not a book for vegetarians or vegans, that’s for sure. Up first is ambrosia, a familiar dish to anyone who has played Sims. This is a salmon fillet cooked with a variety of sweet ingredients to create the perfect combination of sharp sugar and savory fish. The dried hibiscus is a little hard to come by, however, so if you’re having trouble be sure to check out the tea section. The Gunslinger Burritos have somewhat difficult ingredients as well if you don’t happen to have a real butcher around that even sells game meat. For those that don’t, I highly suggest using beef, as it is the most flavorful and would compliment the rest of the ingredients better than chicken or pork – those ingredients being onions, garlic, and mushrooms. Not exactly the most healthy burrito, but this is for those who really just need the fuel to make it to the next fight with the Man in Black. Priced at $15.12 USD for a hardcover version and $11.65 for the Kindle, The Geeky Chef Strikes Back Cookbook makes for a reasonable bargain. Amazon even has a current promotion on for books, if you spend $15, you can get $5 off.